If you are gloriously obsessed with the TV show Scandal (like myself), then you will know exactly who Olivia Pope is. 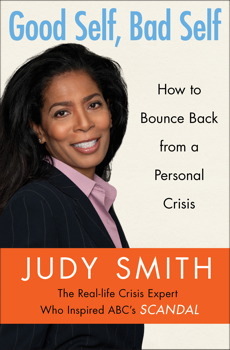 What you might not know is her kick-arse character (a fixer for politicians) is based on a REAL person: Judy Smith. Said person had written a book that I could devour, thereby bringing me one step closer of embodying Olivia ‘Popeness’. The book is based around Judy’s experience of handling many a high-powered crisis and delves into how character traits can be both our biggest success and our undoing. She covers off different traits (envy, ego etc) and details how we can keep them in-check. My fav part of the book is the real life examples that she uses in each section. E.g. the CEO client with the out-of-control-ego – you get the idea! My words: Don’t attempt to be perfect, you ninny – or you’ll end up on TV and in a large disaster where you’ll have to phone the Pope team. Her words: And here’s the crux of it: None of us is perfect. Expecting perfection—in life, work, interpersonal relationships, health habits, driving, studying, you name it—is a surefire ticket to failure. Her words: Of all the lessons and strategies you’ll learn in this book, perhaps the biggest one of all is simply this: A little good old-fashioned self-evaluation can keep you from ending up in the unfortunate position of some of the crisis-ridden folks you read about or see on TV. Know the facts—not what you want them to be, but what they are. Never assume you know everything. The truth always comes out—it’s only a question of when. Read the climate—know the landscape. Know where you want to end up. Admit you are in trouble. You will know when to walk away. Things usually get worse before they get better. Crises occur irrespective of one’s fame, power, or prestige … so deal with it. I particularly love that last one – just deal with it! Want more explanation of the checklist? You’ll need to read the book, or at least watch Scandal for some inspiration!